Numerology is any belief in the divine or mystical relationship between a number and one or more coinciding events. It is also the study of the numerical value of the letters in words, names and ideas. It is often associated with the paranormal, alongside astrology and similar divine arts. The numbers 2, 5, 7 and 13 have shown up multiple times along the Triple Crown trail for Justify. Some of the occurrences may just be pure coincidence, but there are other times that have been downright freaky. Check out the list below! On May 5, Justify won the Kentucky Derby as the 5/2 favorite from post position #7. The Kentucky Derby is run at Churchill Downs, which has an address of 700 Central Avenue, Louisville, KY.
Churchill Downs has an area code of 502. Justify won the Preakness as the 2/5 favorite. 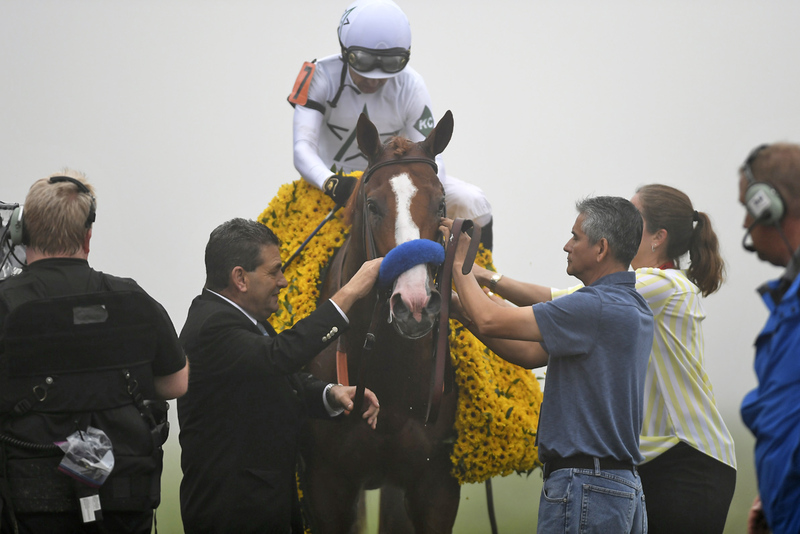 On the day of the Preakness post position draw, connections of Justify flew from Louisville to Baltimore on flight 777. Hours later, Justify drew post position #7. The Preakness is run at Pimlico Race Course, which has an address of 5201 Park Heights Ave, Baltimore, MD. 21215. Hall of Fame jockey Mike Smith is 52 years old this year. Hall of Fame trainer Bob Baffert is from Nogales, Arizona, which has an area code of 520. Mike Smith won the Kentucky derby in 2005, and the Preakness in 1993 (25 years ago). American Pharaoh (trained by Bob Baffert) was the 12th Triple Crown winner and won it in 2015. Justify was born in 2015 on March 28 (or 03/28), which can be added together to equal 13. If Justify wins the Belmont he will become the 13th Triple Crown winner. Bob Baffert’s birthday is January 13. The Belmont Stakes, the third jewel of the Triple Crown, is at Belmont Park, which has an address of 2150 Hempstead Turnpike, Elmont, NY. 11003. AND on the day of the Belmont stakes, 6/9/2018, there will be 205 days left in the year. Maybe it’s all just a bunch of hocus pocus. Or maybe there really is something to these numbers showing up along Justify’s path. Whatever it is, there’s a good chance the hair on the back of your neck is sticking up right now. This post was written in collaboration between EverythingEQ and Ray Manriquez. Read our exclusive “Ferrari on Legs,” originally published in the Spring 2018 issue of Thoroughbred Today magazine, to learn what trainer Bob Baffert and jockey Mike Smith have to say about Justify. Full interview HERE.